Do you need help with a residential or commercial insulation project in the Washington, DC metropolitan area? Accurate Insulation can help. In this era of rising energy costs, choosing the best insulation for your application is more important than ever. Whether it’s for new construction or an existing home or building, having proper installation can save you a lot of money! Studies have shown that improperly or insufficient insulation can increase energy costs. 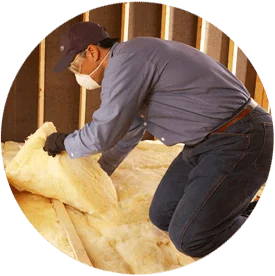 Never ask “Where can I find insulation contractors near me?” If you need insulation installation in Washington, DC or the surrounding Maryland areas, Accurate Insulation is the only name you need to know. Contact us online or call (301) 358-6411 now, or keep reading to learn about our full range of insulation services! Radiant barrier: Radiant barriers are installed under rooflines and help keep homes cool by helping reflect heat from the sun. Where Can Insulation Be Installed? Retrofit insulation, or re-insulation, projects entail adding more insulation to existing buildings. Insulation doesn’t perform flawlessly forever, and there becomes a point when old insulation needs to be removed and new insulation needs to be installed. Home re-insulation can help you reduce your energy bills and live more comfortably no matter the season. If you’re a builder or contractor who needs to work with an insulation company on a new home construction insulation project, Accurate Insulation has the expertise and experience you need. We’ve worked with home builders throughout the Maryland and DC area on new construction projects. Ready to start saving money on your home energy bills? Schedule a free consultation today to see where your home is losing the most energy and which type of insulation will be the most effective for you and your family. We are located in Upper Marlboro and Hagerstown but serve the Greater Washington-Baltimore area. Contact our insulation contractors online today or call (301) 358-6411 to learn more about the different types of insulation we offer to help make your home more energy-efficient and comfortable! We offer a 5% senior and military discount for re-insulation work. Can I Add New Insulation Over Old?